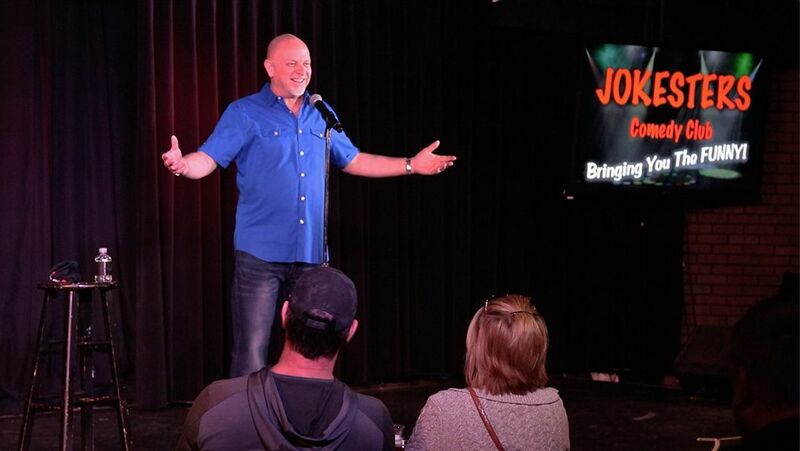 Jokesters Comedy Club in downtown Las Vegas serves up the late night laughter seven nights a week with resident headliner Don Barnhart who joins a long list of Vegas residencies including Lady Gaga, Aerosmith, Blink 182, Billy Idol and more. LAS VEGAS - March 15, 2019 - PRLog -- Jokesters Comedy Club is thrilled to welcome back resident headliner Don Barnhart to his Las Vegas residency. Jokesters is the only full time, professional comedy club in downtown Las Vegas overlooking the historical Fremont Street Experience and Don Barnhart and Jokesters Comedy Club received the 2018 "Best Comedy Club" Silver Award from the Las Vegas Review Journal. Audiences say Don reminds them of a young George Carlin with an animated delivery. "Don's stand up comedy show is a thrill ride of well-written, topical material exploring modern day society in a way that is hysterical, intelligent and thought provoking. Don's ability to keep audiences of all ages howling with laughter and coming back for more is what separates him from the average joke teller". Barnhart just filmed his first Dry Bar Comedy Special for Vid Angel whose subscribers top over 4 million and hopes to bring some of that following to Jokesters Las Vegas. Don is the resident headliner nightly when he's not on tour and features guest comedians seen on Comedy Central, HBO, Dry Bar Comedy, The Tonight Show, Conan, BET, Showtime, YouTube, Netflix, The Bob & Tom Show, Howard Stern, Amazon as well as shining the light on the next generation of comedy superstars. Don Barnhart is also an author and his new book, Rock Bottom is the story of a returning Veteran who ends homeless on the streets of Las Vegas becoming the Robin Hood of the disenfranchised and finds his way back through comedy. The book is currently being turned into a feature film. Barnhart's other book Finding Your Funny is a Best Seller List on Amazon. With a humorous and heartfelt forward by Comedy Legend George Wallace, Finding Your Funny goes beyond Barnhart's own 25-year journey and shares the brutal, often overlooked experience and advice of other comedians, entertainers, managers, agents and bookers. Barnhart is also the author of Creating The Life You Desire and a contributing author on I Killed. Over the last year, Barnhart started producing and directing Jokesters TV, the late night comedy show featuring the best of Jokesters comedians. Don's film career has really been gaining steam as he also stars in the documentary, Finding The Funny with Brad Garret and Louie Anderson and plays a rather disgruntled, road weary and carefree comedian in the upcoming comedy film, Tribute To Fluffy. Don can also be seen playing a psychotic mad man in the new web series Max Justice. Besides all of this, Barnhart has been entertaining the troops and since 1992 and stars in the new documentary I AM BATTLE COMIC by filmmaker Jordan Brady. In his off time Barnhart teaches stand up, improv and comedy writing at The Las Vegas Comedy Institute. Located on the 2nd floor showroom inside the D Casino Hotel and was already named Best Comedy Club by Casino Player's Magazine and one of the Best New Shows by Vegas.com Jokesters Comedy Club offers FREE Valet and Validated self-parking and there is no 'drink minimum'. Celebrities are always popping in to do guest sets and you never know who might appear unannounced. "One of the reasons comedians love to perform at Jokesters is that we are truly a comics showroom", said producer/comedian Don Barnhart. Jokesters Comedy Club is currently in negotiations to franchise their brand opening up other comedy venues across the country. Barnhart added, "Ideally, we would love to be Jokesters Honolulu as we already have so many Hawaiian locals in Vegas and who wouldn't want to live in both Vegas and Hawaii?" Many of the comedians performing at Jokesters Comedy Club also spend time overseas entertaining the troops with Don Barnhart's Battle Comics, which is why Jokesters always offers ½ admission to active military at his venue. Jokesters is conveniently located inside The D Casino Hotel and features 3 hours of FREE Validated parking and is already considered one of the best Comedy Clubs in the country and also produces Jokesters TV.